This week we have a series of interviews from Pax East. Every day is a new adventure as Andrew loses his voice and his mind. Enjoy! Pax East 2018 is upon us. 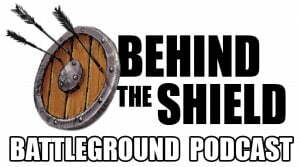 Andrew interviews Chase and Derek about preparation for the show and booth construction, and also interviews Andrew Kelble, one of the folks running the Battleground Arena at the show this year, about how the Arena works and what to expect from that.